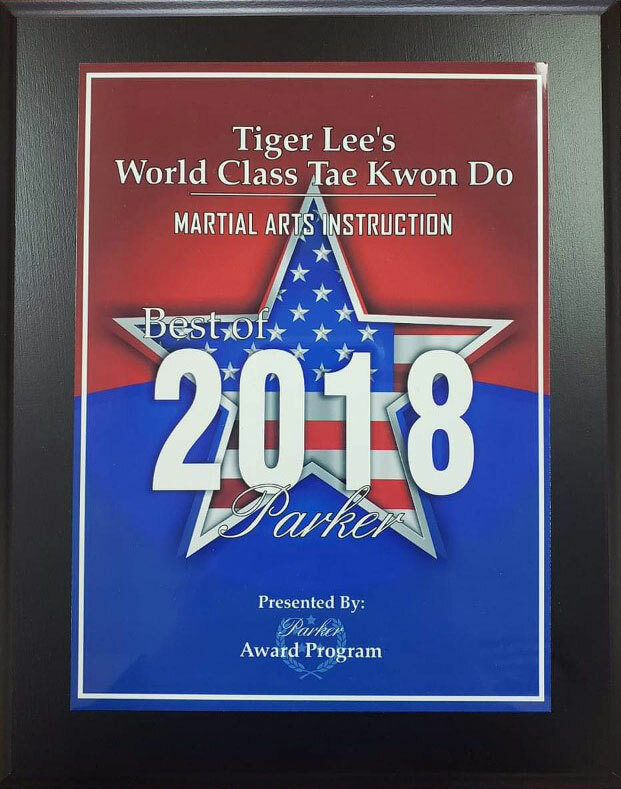 Tiger Lee’s World Class Tae Kwon Do has been recognized as the Best of 2018 in martial arts instruction. Working through a martial art and the belt ranking system gives kids measurable goals to follow that are realistic to attain. The sense of accomplishment a child feels by mastering a new technique or graduating to a new belt follows him everywhere he goes! At Tiger Lee’s , we teach families, as well as individuals. The change in a family’s demeanor after a few months is amazing. It becomes a source of fitness and team building with a bit of friendly competition, too. Many families will find that they have something in common and will share their time on an off the mat. Do you need more energy, a boost in self-confidence and a great way to reduce stress? Then Tae Kwon Do may be the perfect fitness program for you! Tiger Lee’s martial arts classes are a great way to instill confidence, build strength and agility, control weight, sharpen focus, increase self-discipline and respect, reduce stress, and develop coordination in a fun environment where you will build lasting friendships with positive, like-minded individuals. We strive to provide a clean, bright, and safe training environment – the finest facility, and the best martial arts instruction available in the Denver area. At our school, we are dedicated to maintaining an encouraging atmosphere and learning environment. It is our intention to balance positive discipline and a high level of expectation with respect, enthusiasm, encouragement, and support. We constantly do our best to be role models for what we would like our students to learn. At Tiger Lee’s World Class Tae Kwon Do, our intention is that our students learn skills to be prepared for success in life as well as in martial arts.